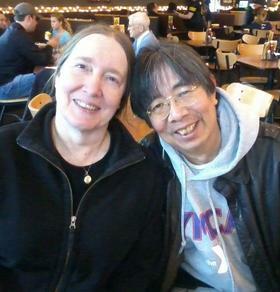 NI, Phillip Fei-Pu Of Mattawan, Age 70, died on December 23, 2018 in Kalamazoo, MI, after a long illness. Phillip was born December 24, 1947 in Chicago, the son of Ernest and Katherine (Kao) Ni. Phillip graduated Oberlin (1970) with a BA in Chemistry and University of Michigan (1981) with a PhD in Pharmaceutical Chemistry. In-between degrees he spent two fulfilling years in Ghana, Africa through the Peace Corps. After a career as a research scientist at Upjohn/Pfizer, he spent his retirement with family and training for marathons. He ran in over 10 marathons across the country, including in MA, HI and WI. However, he always claimed he didn’t so much run marathons as shuffled through them. He is preceded in death by his parents, wife, Susan Machkovech, and son, David Ni. Phillip is survived by his siblings, Randy Ni and Mary Ni and daughters: Jennifer Ni, Diana Ni (Jon Kamm), and Katherine Ni (David Haskell). A memorial is planned for later in 2019.